I get asked a lot if I have had any strange food cravings. The only thing strange my cravings is that I have them. Pre-pregnancy, I rarely craved food. I ate out of necessity. 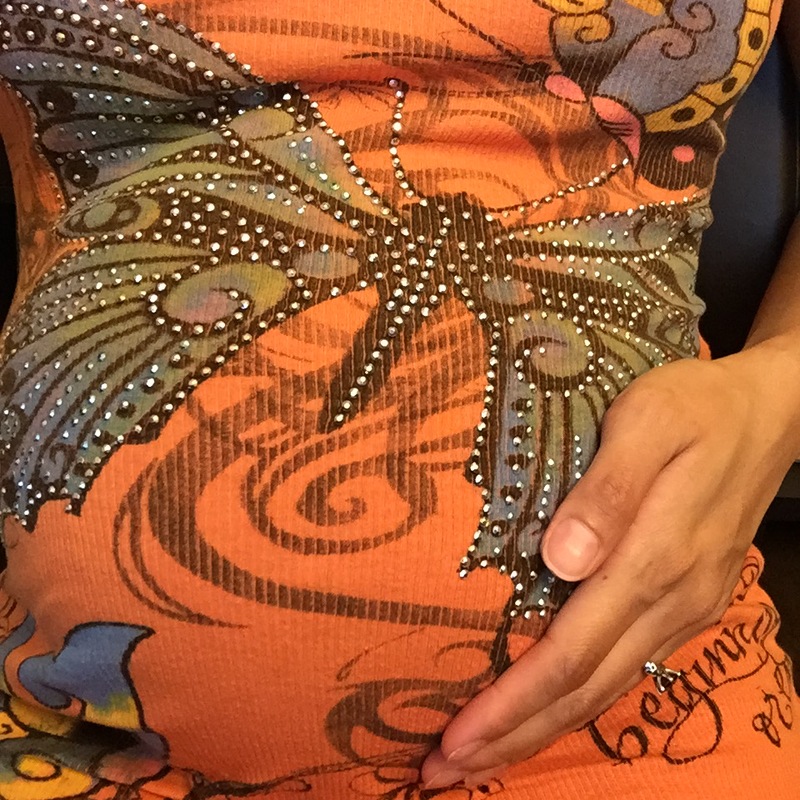 At the beginning of my pregnancy, I was always hungry and craving various things. 20 weeks into my pregnancy, I’m always feeling hungry but my cravings aren’t as frequent. Can you imagine how terrible it is to be hungry but not sure what to eat because you’re not craving anything? Let me tell you! It’s torturous! Luckily, I’m happy eating most things because it placates any hunger I’m feeling. When I get cravings, it’s usually for cheeseburgers or tacos from either Taco Bell or Jack in the Box. Which is funny because I didn’t like eating beef pre-pregnancy. The downsize to having these cravings is the indigestion that follows. I’ve had many uncomfortable sleepless and uncomfortable nights! You’d think I’d learn after the first few times! Unfortunately for me, it’s really hard to resist the craving when I have them! I never ate chocolate cake before. I didn’t eat cake in general. If I’m feeling pressured to take a slice of cake at a party, I’d usually opt for a vanilla flavored cake. Chae would sometimes want me to eat a piece of his chocolate cake and I’d take half a bite just so that he’d leave me alone. I’m not a cake person! However, at my nephew’s birthday party at the beginning of May, I had taken a half bite from Chae’s chocolate cake and it tasted AMAZING! I made him grab another slice for me because I didn’t want to share! I went to New Orleans over the weekend for my good friend Tina’s Bachelorette party and had ordered a Brownie a la Mode for dessert and it was heavenly! Who knew chocolate cake could taste this good! As I’m typing this entry, I’m snacking on chocolate Oreos! haha So yummy! Which reminds me, I also get cravings for milk. I never drank milk before because I didn’t like how it tasted, but now I really enjoy drinking it! 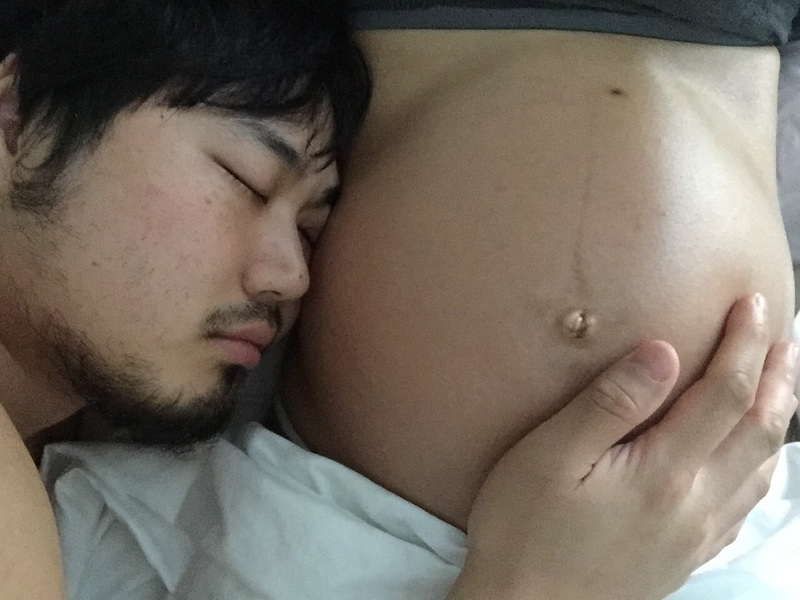 Before I end this entry, I wanted to share a photo I took this morning with my husband cradling my pregnant belly while he was still sleeping. It’s so adorable and needs to be shared! The cutest thing happened last night. One of our babies kept “kicking” me when I was laying in bed. I put “kicking” in quotes because it might not have been kicks. She/he could be hiccuping, turning, or something else entirely! It felt like a little pop on the lower left side of my belly. I usually feel one or two “kicks”, but this time it was eight or nine “kicks”! After the second pop, I placed my hand on the lower left side of my belly to see if I could feel the “kicks”. They usually settle down by the time I put my hand on my belly so I will miss the pops. I got to feel the third pop! “Whoa, the baby is being super active!” I kept my hand on the side of my belly and felt another POP! Above: The movement was coming from here. Chae wanted to get in on the action when he heard all of my commotion. He replaced my hand with his and waited. I felt the pop but he said he didn’t feel anything. “I think the baby has gone back to chill mode,” he told me. He said he didn’t so I readjusted his hand on my tummy. He was probably in the wrong spot. Haha, it was the cutest thing!! I put my hand back on my tummy and waited for more pops. Sure enough, the baby kept on moving. After enjoying a few more pops, I decided I’ve had enough excitement for one day and settled into bed for some much needed sleep! More pops could have been going on while I was sleeping, I will never know! 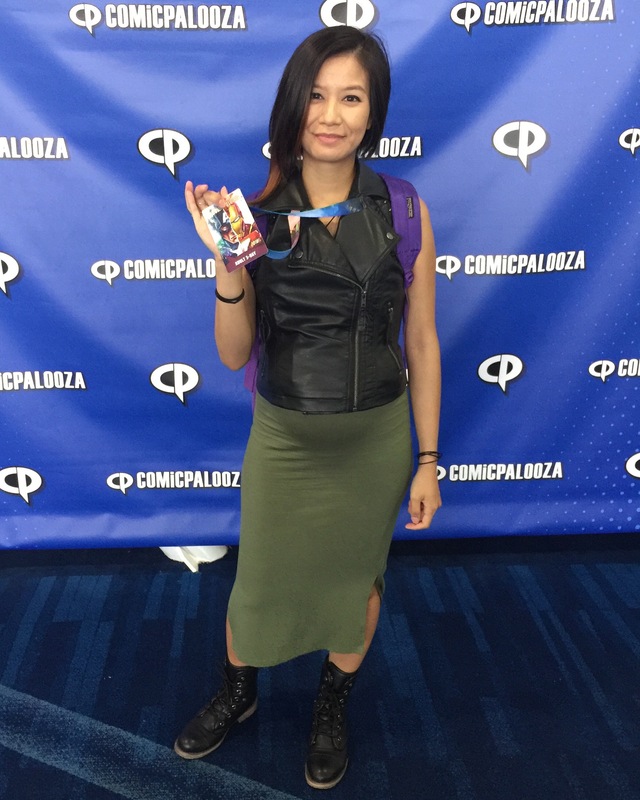 Today was the second day of Comicpalooza and my energy level was not as high as yesterday. I lasted twelve hours at the convention yesterday! I didn’t make it through the whole day today. I left the house at the same time as yesterday but left five hours earlier than yesterday. I was tired, my legs were sore, and I wanted to lay down. There was no need to push myself any further today. Above: First day at the convention. I had felt the twins move when I sat down to eat my lunch. The movement was near the top of my belly. I felt three “pops” and then things settled down. I’m excited to finally be able to feel them moving more frequently! Also, I think they’ve gotten large enough to “sit” on my bladder. I was walking around the convention when I suddenly had a “funny feeling” in my bladder. It felt like it was being pressed on. It was uncomfortable, but not painful. It also made me feel like I needed to use the restroom. Luckily, I had emptied my bladder right before this happened, so I knew I didn’t need to pee. I wiggled a bit and placed my hands under my belly to support it. The wiggling was meant to readjust the babies positions inside of me. The pressure on my bladder went away. 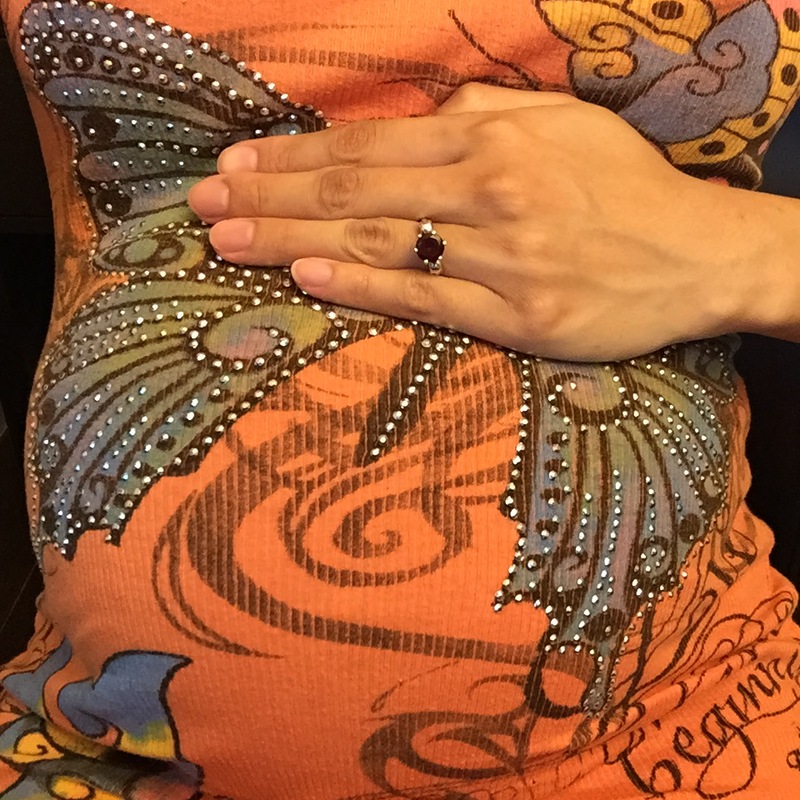 When I let go of my belly, the feeling slowly returned. This had to mean that the babies are sitting on my bladder! So, what did I do? I walked around holding my belly. I have never felt more pregnant and I loved every moment of it! That’s how far along I am in my pregnancy. I was keeping a journal on 750words.com, but lost the strength, energy, and interest in trying to write 750 words every day. I completed one month of writing every day and it was exhausting! At least I was able to do that, so I am satisfied. I’m back on WordPress now. I like that I can attach pictures easily on here. I’m hoping to print out my blog entries for my pregnancy book once our twins arrive. It’ll be nice to have a memento to recount all the new things I’m experiencing with this first pregnancy! I know, this is completely different from everything I’ve posted in the past and I’m feeling weary about sharing my personal experience publicly. However, I have found other pregnancy blogs extremely helpful so I am hoping my entries will help someone else out there, too! So what is new? Morning sickness finally subsided but headaches replaced them. Monday, May 9th was when the headaches started. It was so bad, I let out little sobs throughout the day. I gave in and took an extra strength Tylenol. One and a half pill instead of the recommended two pills. One pill is all I ever needed, but given the severity of the headache, I decided to up my normal dosage. I waited for the headache to melt away, but gave up when nothing changed three hours later. The next day, the headache was still there, but not quite as bad. I noticed that walking around helped my headache. Every time I sat or laid down, the headache would come back full force. I tried my best to keep busy and to avoid sitting down by doing chores and going for walks, but eventually, I had to sit down. I can’t stand all day! I was tired and exhausted. I’m carrying two babies! I left the house Wednesday and Thursday to go “shopping”. I didn’t buy anything, but it kept me busy with few opportunities to sit down. I felt good on those days and the headache went away. It would peer from it’s hiding place a few times, but nothing that I couldn’t handle. I woke up suddenly in the middle of the night on Thursday and Friday because my head was pounding. I would get up to use the restroom which would help ease the headache. I’d get back to bed and would have trouble falling asleep because the headache would come back, but eventually passed out from exhaustion. I was given no relief from the headaches over the weekend, so I called the doctor on Monday. She told me that my headaches were possibly tension headaches and prescribed me muscle relaxers. They are a Class B medication and will not harm the babies. I later found out the Class B means that there has been no proof adverse effects on the fetus but not enough studies have been done to confirm this. This made me weary about taking them. My headaches got bad on Wednesday, so I gave in and took one muscle relaxer. Best case scenario: it’ll work and my headaches would disappear forever. Unfortunately, it did nothing for the headache. It made me very drowsy so at least I was able to sleep through most of the headache. It’s been a little over two weeks and I still have the headaches. However, they’re not as bad and I’m able to deal with them. I increased my water intake from 60 ounces a day to 75 ounces. That seemed to help quite a bit with the headaches. Kristen reminded me on Saturday that I need to up my water intake because I’ve gained weight. I don’t know why that never occurred to me before! She suggested I do 125 ounces of water a day, but that sounds like a ridiculous amount. “You need to drink your body weight in ounces plus 25%,” she told me. I decided to do half my body weight plus 25%. I’m going to talk to Dr. F at our next check-up and see how much water and protein she recommends. If she tells me I should be drinking 11-12 glasses of water a day, I might lose my mind. I’m 100 pounds and the average american female is roughly 140 pounds. It makes no sense to me that I need to drink the same amount of water as a 150 pound pregnant person. I hope she doesn’t disappoint me and give me a number based on my size. I can work with this. Well, unless she can give me good reasons as to why we all have to drink the same amount of water. I’m open to it if she can makes sense of it to me. I’ll do my best to catch us up in the next few posts, but for now, namaste!